The first game in the series, which put an innovative spin on the deck building genre. A stand-alone sequel introducing six new animalfolk decks to the series. New decks, new gameplay features, and a larger box for storing all content in the series. 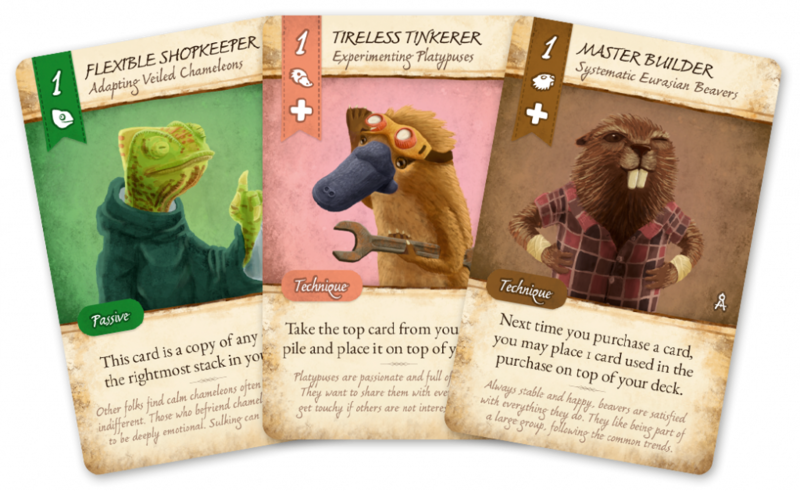 A single deck mini expansion featuring the Systematic Eurasian Beavers. 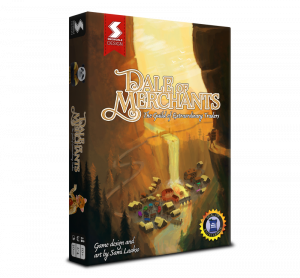 Every Dale of Merchants game, except the Beaver expansion, is a stand-alone product and a good starting point to the series. They do not require the earlier games in order to be playable. However, all games in the series are fully compatible with each other. Decks and other elements can be freely combined across the games for increased gameplay depth and variability. What is Dale of Merchants? 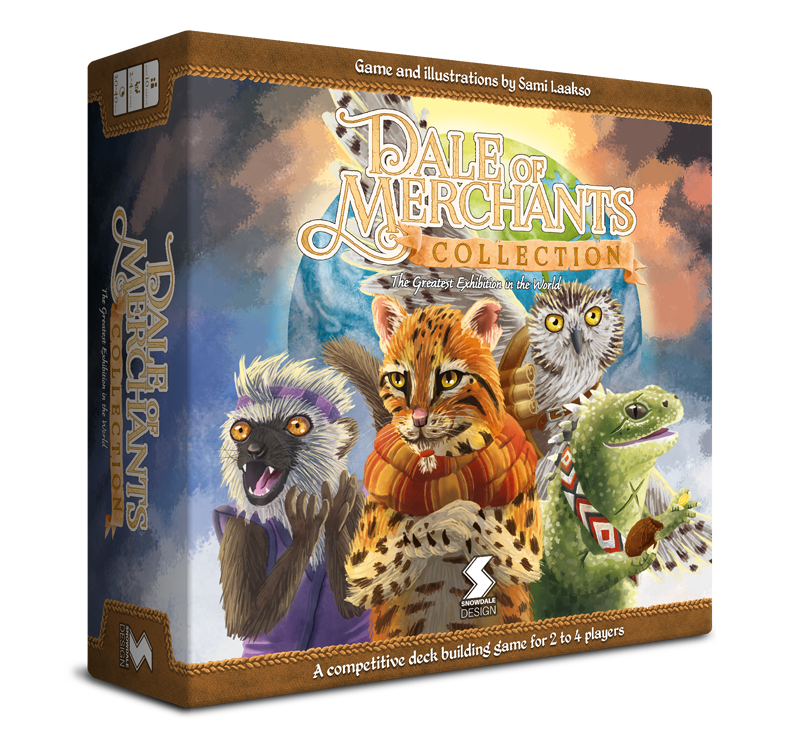 Dale of Merchants is a series of deck building games developed by Snowdale Design. The games are set in Daimyria, a world of animalfolks. Another game taking place in the same setting is Dawn of Peacemakers. A deck building game or a deck builder is a type of a card game where construction of a player’s deck takes place primarily during the game and is an important aspect of the gameplay. Dale of Merchants is a fresh take on the deck building genre and boldly breaks the norms to deliver a unique and gripping experience to fans of competitive card games. The core component in the series is the animalfolk decks. Each deck is themed around a single animalfolk and contains a variety of multipurpose cards representing the qualities common to said animalfolk. Every game in the series includes a unique selection of animalfolk decks. A selection of animalfolk cards from different decks. 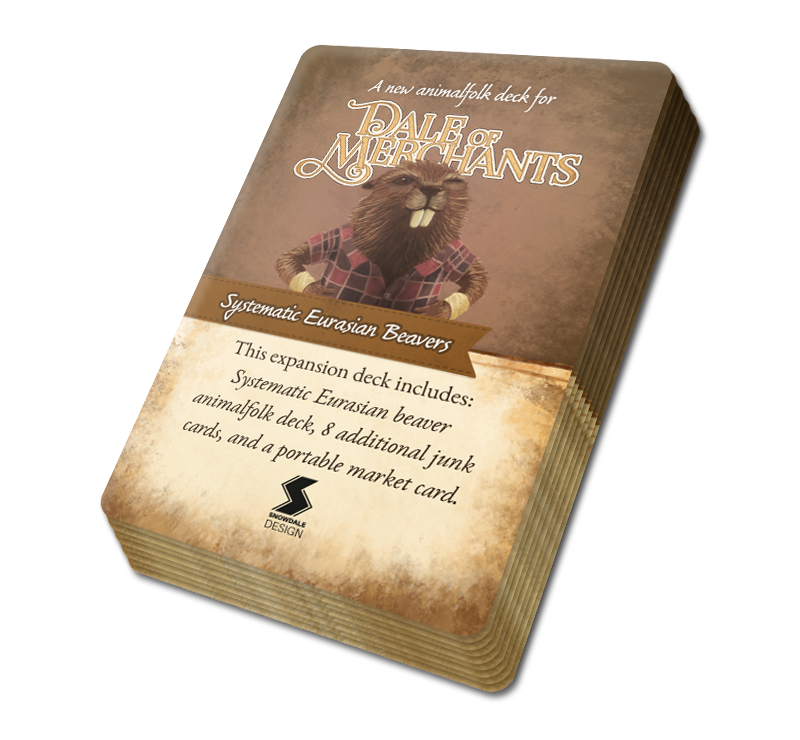 For each game, the players pick the animalfolk decks to be used. 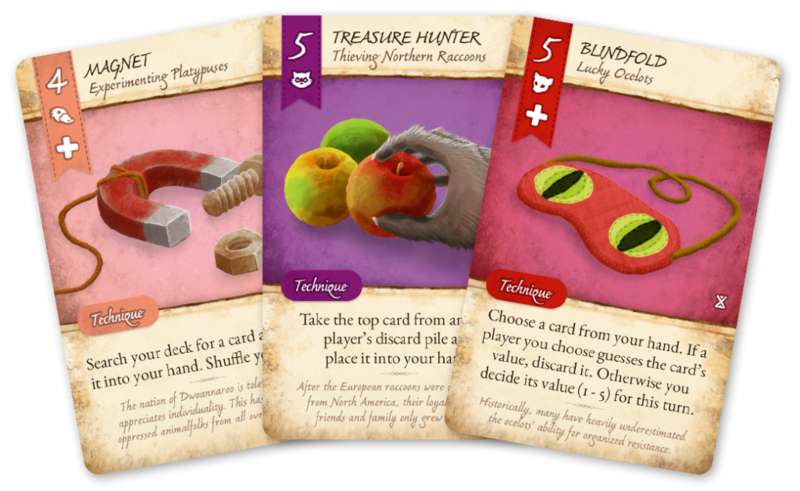 As each deck is unique and focuses on different aspects of the gameplay, this selection allows the players to customize each game to their liking. For example, the amount of player interaction can be increased by including decks that allow stealing other players’ cards or otherwise disrupting their game plan. As a result, each game is very different from the last. How do you play Dale of Merchants? 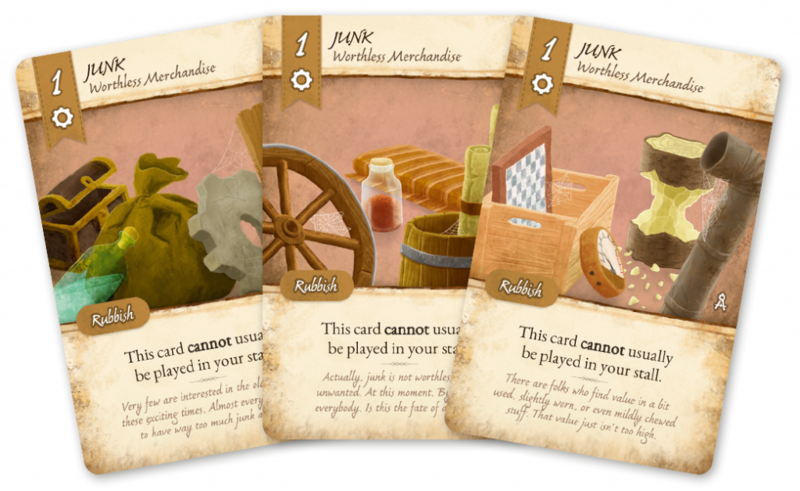 The objective of the game is to build a complete merchant stall by playing eight stacks of cards in ascending value. The first player to do so is the winner. After choosing a number of animalfolk decks to play with, each player’s starting deck is formed by taking one of the lowest value cards from each of the chosen animalfolk decks. Junk cards are then added until the players’ decks have a total of 10 cards each. Junk is useless most of the time. It’s primarily used for purchasing new cards from the market. However, certain animalfolks have found some cunning ways to utilise it. The rest of the cards in the animalfolk decks are shuffled together to form the market deck. During their turn the players are able to purchase cards from the market by paying the appropriate price by using their own cards. Purchased cards are placed in the players’ hands. As cards leave the market, new ones are drawn from the market deck to replace them. Keep in mind that the newest stuff tends to be quite overpriced! New cards can be purchased from the market. The cost of a card is the sum of its value, printed on the top left corner of the card, and the market mark-up shown above the card slot. At the start of the game and at end of their turn, players draw cards from their deck until they have 5 cards in hand. As unused cards are not discarded at the end of the turn, cards can be saved for later turns for a better opportunity or a powerful combination. During their turn the players have several possible actions they can take. They can do any of the following. Using any of these actions ends the active player’s turn unless a card effect allows the player to continue. Many technique cards feature a bonus action icon (+) that allows the player to take another action after resolving the card’s technique. Additionally, many cards feature passive or previously initiated delayed effects that can be resolved during a player’s turn. Card effects are powerful and properly utilising them is the key to victory. Whenever a card is used for an action, it is placed on the player’s discard pile. Whenever a player’s deck runs out, the discard pile is reshuffled to form a new deck. Some card effects allow manipulating the decks and discard piles, even those of other players! Stacks in a player’s merchant stall are built in an ascending order, with their values increasing from 1 to 8. Stacks are built by playing a combination of cards from the same animalfolk deck with an appropriate total value. When a stack is built, those cards can no longer be used for other actions. As always, some card effects may allow the player to bend these rules. When a player completes their 8th stack they immediately win the game. Paths to victory may differ greatly from game to game but finding the right balance between acquiring new cards, utilising techniques, and building stacks remains a crucial challenge. Building too quickly could leave a player’s deck weak and unable to complete the final stacks, allowing others to catch up. On the other hand, neglecting to build stacks when an opportunity arises might allow an opponent to get too far ahead. At the same time, card effects should be used to maximise the effectiveness of one’s own deck or to hamper the competitors. 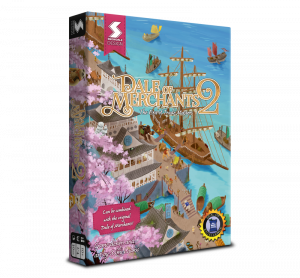 Snowdale Design co-operates with other publishers to bring Dale of Merchants games to languages besides English. The list below displays all of the currently available Dale of Merchants releases. Read more about the individual games on their own pages linked below. All English Dale of Merchants products can be purchased from our online store.